•Submitted artwork should represent the theme "Emotive Portraits." •The world of Elfquest is fraught with emotion and this theme allows you to convey that emotion using only the characters face and expression. I know this may seem like a difficult task but what is more lovely than when Savah smiles and the lines around her eyes crinkle and you know she is truly happy. Or when Strongbow gives one of his signature, I'm not happy looks. You don't need anything but that expression on his face to know you're in big trouble. Take a look at the comics to gain inspiration. •You may use any one character in your submission as well as any one emotion. •Because there are so few people able to submit art to the calendar you are required to PM Maggie with three character/three emotion choices so she can make sure there are no duplicate entries. Please do not begin your submission until you hear back from Maggie. She will also post a list of used characters and emotions so that we all know what is still available. •Here is an example of an acceptable choice: Pike has a huge smile playing across his face, his cheeks are bright red and his eyes are out of focus. I suppose drunk isn't exactly an emotion but this theme is mostly geared toward telling the viewer what is going on using only the expression on the characters face. •Here is an example that is not an acceptable choice: Ember is holding her eye and wagging her fist at a bird with a pointy beak. You can tell she's mad and that the bird pecked her in the eye but using her hands and the bird in the scene gives too much away. •You may show the character from just below their shoulders to the top of their head. You may also use some other imagery in your submission such as some leaves or a blue sky in the background. Please do not use anything that assists the viewer in figuring out the emotion you are trying to convey or any limbs, this is all about portraits and expressions, so the face is the key. •Note: you don't have to leave room for poetry this year. •Calendar entries will be viewed by the judging panel at Elfquest Fan Art http://www.elfquestfanart.net and displayed there once the calendar is published. However, due to size constraints at the site, you will still have to email your full-sized entry to Maggie. Please PM Maggie when you have an entry ready to be submitted. •Artists may submit up to three entries. •Entries must be received by midnight CST, October 14th, 2014. •Description (Optional): Any text/story/quote you feel enhances your artwork. •Keywords (Optional): Keywords are used for the gallery "search" feature only. After final selections have been made, all submissions will be made available to visitors. •Preferred Month (Optional): What month you would like your entry to be featured on (no guarantees, though). •The twelve winners will be chosen by a panel of judges (TBD). The following are the characters/emotions that have been submitted so far. If you see a character or emotion on this list consider it off limits for the time being and submit something else as your idea. Remember there are a lot of different emotions, not just the basic love, hate, sadness, joy etc. I would also like all types of characters represented in the calendar, this includes: Wolfriders, Sun Villagers, Go-Backs, Trolls, Preservers, Humans, Wavedancers, Gliders, High Ones and Wolves. Here is a bit of an example, so you know what I am looking for: http://www.rivertwine.com/artpageview.php?id=1648 Without the speech bubble of course. I'm surprised you chose landscape orientation. It will be more difficult to "hide" surroundings than in portrait oriented pictures. Yes, I'm curious as well about the landscape orientation for what sounds like art that's really supposed to be nothing BUT head-shots, without too much in the way of background elements. It sounds like we can use decorative background elements, but that's it, right? It's just… with landscape orientation, it seems like a head-and-shoulders portrait leaves a lot of horizontal space empty, if you decide to show the entire head. I don't really mind the landscape format. I like the idea of leaving space that draws the eye in. the Golden rule is one of my favorite formatting tools! MWAHAHAH I can totally use the drawings I've been working on! BRING On the Art collaboration boys and girls... My coloring fingers are ready to GO! I don't mean to sound super-opposed to it! I'm just interested to hear the thinking on it, and ideas for how to make the most of some of that leftover space. I concur that having everything focused on the face makes a Portrait layout more sensible in my opinion. However, landscape offers some interesting background potential as well. My only grievance is restricting the use of hands/gestures. There are many more, dramatic emote options that incorporate hands. For instance, the Facepalm, or clapping hands over cheeks or mouth as part of laughing, or suprise, or hair-pulling exasperation! Or are using hands in that context ok, but that creating an illustration (image that tells some kind of story) is bad? What you want are expressions of pure emotion, correct? The reason behind that is there isn't really a portrait option to use as a printed calendar. The one we used for "Every Picture Tells a Story" was a big issue and I don't believe they carry it anymore at Café Press. Richard had to do some work on that one to make it...well work. I want things to be as easy on him as possible considering he has far better things to do than wrestle with our fan calendar. Also the Moonshade part of my cover for the "Every Picture" is more of a landscape size and it works. That is actually where I got the idea (before I incorporated it into that calendar) for the emotive portraits. For this calendar I would probably go even closer but I have done several "landscape" portraits and they end up being a bit of a challenge but it is fun finding ways to use up the space provided. Yes, pure emotion no hands. Although I get what you are saying. However could you imagine how awesome it would be if you could convey an elf about to facepalm without the use of any hands. I'm wondering about the emotions. Namely the list. If someone has choosen Winnowill and used added seductive, as emotion, does that mean that others cannot use seductiveness either? Another question I have is that in OQ Wendy drew Cutter and Leetah reflected in Rayek's eyes to convey his jealousy. I understand that above example would say too much for this challenge, but let us say someone chose anger as emotion, would fire reflected in the characters eyes be too much too? Ok, so maybe we should call the theme Expressive Faces, ha. Thanks for clearing things up. Personally I hope not. If hands aren't allowed, imagery in eyes shouldn't either. It's like using a droplet floating half next to the face as to indicate stress in anime. That is not how to portray an actual expression, it's just a symbol (one of the things I loathe about anime style actually). 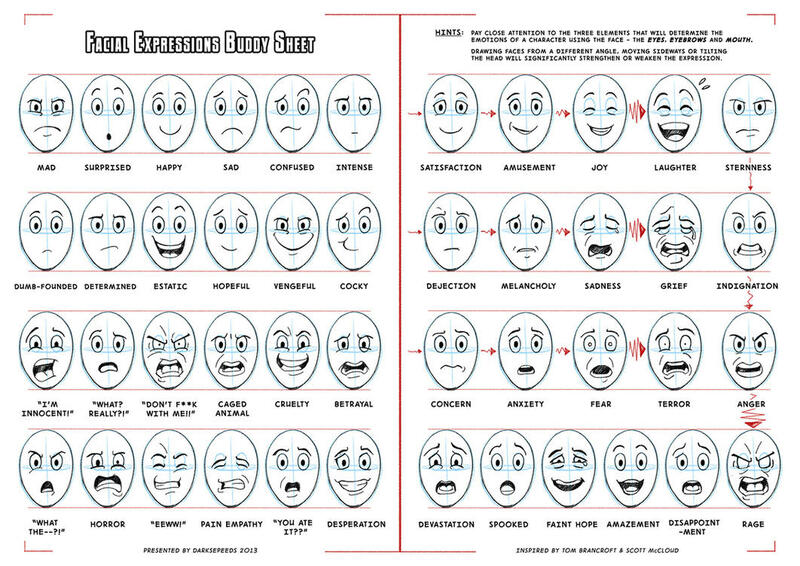 I really hope everyone will be able to portray real emotions as the face would show them, difficult as it may be. There are so many muscles in the face, every subtle movement can change the expression. The particular example you chose shows jealousy in more ways that the reflection in Rayek's eyes. Check out his eyebrows, the top part of his nose, and the slight tension in his lower eyelids. Look at yourself in the mirror and think of several emotions, see what they do to your face. Some can be very exaggerated, others are more subtle. The subtle ones will be more difficult to draw, but they will be a nice challenge. I agree with Afke, no images in the eyes. It gives too much away. On a completely different topic...the list if submitted characters/emotions can be found with the rules/guidelines above. If you have yet to submit an idea to me please check the list first to see who's been taken already. I am going to wait until everyone has their character and emotion ready to go before I choose who's going to be on the cover. This is probably going to be one messed up cover...haha. Humm, seems my 1st post was eaten by the almighty nulldevice on the server. This is a partial reply to the theme poll thread but also to this one here. Hmm, why not take the official Elfquest.com avatar generator? They have a lot of expressions on stock. I could send this in. Well. I am sitting here at work (yes, holy Easter sunday and I'm at work) and I took the thread as saved file with me since I do not have internet access here. I decided to have time (though I actually haven't really that much) to re-view things. Did you read more between the lines of my post than what actually was? Yes, I was a bit disappointed since "my" topic contrasts was again overvoted for the "10th" year in a row and I (would have) had instantly lots of ideas for that (also for teachers and leaders). Things that I would have liked to draw, maybe with a humorous twist. I mean there are also many possibilites for just portraits with emotions (as I wrote), but for me it seemed hard to only focus on the face. This is like setting all out bets on one card. At least that is when you're not a regular artist. But I was far from wanting to make /root cry or saying the topic would be evil. I was just expressing my concern if people would gain enough momentum to get the calendar filled. This was just out of my personal experience in life: Sometimes people want something and vote for it but when it comes to the actual work there are not enough hands to do it. But okay, people seem to be motivated. Also I was noting (see Tah-Marien's post in the voting thread further down) that few people had voted so statistic results would not be even. But okay, people seem to be fine with it. Next point is: I was / am writing out of a relatively dire life situation that you can't know about. I am still overloaded with work and stress which doesn't make me do happy faces. This will change at the end of month to a different workload and stress (hopefully less!). Then, later that year, besides a lot of other projects I am working on, I will face unemployment and maybe I will have to move to a different town for a new job. Moreover I will have to defend my PhD some day this year. And in a phase of utter stress (that has been for the last, maybe > 10 years) creativity falls a bit short. I am much more creative and positive thinking once I am sitting in the forests, far away from life's troubles and things that keep my brain busy. So maybe you understand my somewhat thwarted motivation. I also know that til Oct 14th it will be a shorter time span than it looks now, at least for me. I might still give it a try. Read below. Well, now I found the guidelines thread. It was mere 2 days old (in my timezone) and my favourite character was already taken(*). On the other hand his face is probably hard to draw (somehow) and it was the part in the past calendar which took most of the time. Next in row (Venka), also taken. Emergency solution I thought of (trolls, e.g. old Maggoty): already taken. Also expression-wise it isn't easy to find many more different expressions. Some are just higher / lower levels of the same emotion. I should check psychology literature how many (human-readable) emotions exist. Anyway, Starskimmer's posting here is a good start for inspiration. (*) As far as I understood: Once a character is taken it is taken. There are no two of the same characters with different emotions. Also: If an emotion is taken, it is taken and there are no Leetah and Shenshen (but) both with the emotion joy. Well, then Clearbrook isn't taken yet, right? (Good to have so many characters I like.) People, I'm writing this offline so please don't take her, too, until I am back online. Now how to make her look at you with her endless soothing calmness without making her look bland or empty? Or better give her an amused look? I don't know. I am not sure if we as humans would interprete a wolf's expression correctly. But then, it is a comic so it won't hurt if we put alleged human facial expressions of feelings on an animal. Well, one could put a picture in a reasonable format (actual portrait, not landscape) and a text besides it so it is landscape in the end again. Probably those people a Cafepress only have one blank "standard" template format for printing so it needs to be landscape. Oh well. I would expect more professionalism there. I mean, a worldwide operating print and sell your stuff shop should have lots of options, right? Or did I miss something in the picture? Either way we could just leave space besides the portrait (and have it in actual portrait dimensions and not this ridiculous-for-portraits format) and put text (so lyrics, descriptions, stories) besides it. Or what about putting TWO portraits besides each other? Given that there might be >= 24 entries submitted. Just as a possibility. I have added Clearbrook to the taken list jaRf. Also, I have received the first submission for the calendar, you guys are sure working up a storm. How many pages will the calendar have? Are there 37 possible Submissions till now? And one is allready finished?! That's awsome! And to see what everyone creates makes my day! Just 12 entries will make it into the calendar. Of course all entries will make it on to the website for everyone to see and comment on. Just checking in on the calendar progress. We have two entries in already which is awesome. I got halfway through mine but I'm not sure I like where it's going so I may end up doing more than one version to see what looks best. Not gotten anywhere besides the concept... But I still think I should be able to finish this latest in October. Silentleaf, I might ask your help again and be it just to make my entry look more awesome! you got it my lady! Silentleaf, if you have a problem with junk mail then you shouldn't be posting your email address publicly or if, then not in clean text form which can be parsed easily by bots. Spam filters have become better but still I never rely on them since they still catch false positives and let real junk through.